In Electric Tube Cleaner, the brushes or other cleaning tools are rotated through a tube at tip of flexible shaft. Simultaneously water gets injected, hence loosen deposits leaving tubes cleaned. Flexible Shafts for Wet Cleaning (Nylon Casing) ensure use in bent tubes. This Tube Cleaning System is also know as HVAC Tube Cleaning Or Automatic Tube Cleaning Machine. 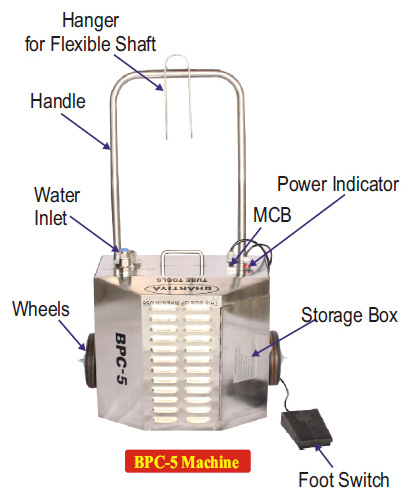 All models consist of tool storage box, single direction foot switch, mobile dolly. 2 direction foot switch is optional.